We made the move from our finger to a stylus and now we can move from the stylus to a brush. The folks at Sensu have managed to design a brush that can be used on your precious tablet with most of your favorite apps, such as Paper. 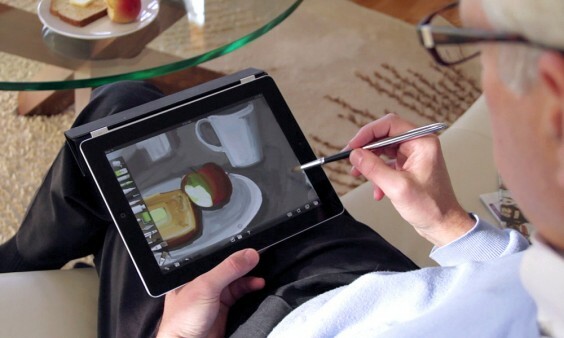 The Sensu Brush works with capacitive touch screens like the iPad and iPhone (all versions), Kindle Fire, Samsung Galaxy, HTC Desire S, Google Nexus S, the Motorola Atrix, and many more. For $39.00 you need to get yours now! 4 Comments on "Sensu Paint Brush"
Hello Sharon, we have contacted the folks behind the Sensu brush to see if we can help you out. Is there an email we can reach you at with the details? You can send it to info@sunriseartists.com. I have a cintiq 21 by wacom. Can the sensu brush work on this? It’s not “touch” enabled. I don’t think it does. It is really designed for the iOS interfaces. You can always check directly with them and even submit it as a suggestion. It would be amazing if it would work with the cintiq!